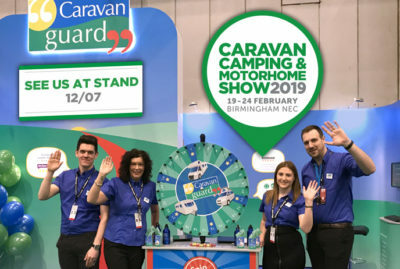 The start-of-the-season showcase – the 2019 Caravan, Camping and Motorhome Show – is just days away! 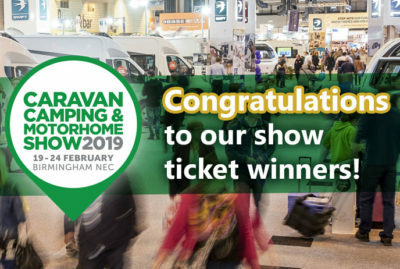 To celebrate the Spring show and our 20th year at the NEC, we gave 50 lucky people the chance to win a pair of tickets to this fantastic event. Thank you to the thousands of you who entered – we’ve got plenty more competitions coming up over during spring and summer – so stay tuned to our news blog! Congratulations everyone! We’ll see you in hall one, stand number 12-07 – enjoy the show! If you weren’t lucky enough to win, tickets for the show are still on sale and if you use our exclusive discount code – CGUARD – you can buy tickets from just £6.50* – saving £2.50 on the on-the-door price and 50p on the normal advanced price. *£6.50 Senior (over 60s), £7.50 Adult when booking before 23:59hrs 18/02/19, after which time prices revert to the on-the-door price of £9.00 Senior and £10.00 Adult. A £1.25 transaction fee applies. Calls cost 7p per minute plus your phone company’s access charge. Car parking is included in the ticket price. No dogs (except assistance dogs). Children 15 years and under go free when accompanied by a paying adult/senior. Tickets are non-refundable.